Reader purplemoonshoes and Wheaton Calling remind us that there's a meeting tonight to discuss the future of downtown Wheaton. Local developer B.F. Saul's been given the reins to build in an 8.2-acre area around the Wheaton Metro station, bounded by Veirs Mill Road, Georgia Avenue, and Reedie Drive. While Robert Wulff of B.F. Saul told the Gazette that you won't see shovels in the ground until 2015, he's looking forward to the "listening tour" the developer, the county and WMATA are kicking off to get the community's opinions. Certainly, there's been no shortage of meetings on the revitalization of Wheaton over the past several years, and it's understandable for local stakeholders to feel tired of the whole thing. After all, why wait for your new downtown when one's already waiting for you down the road? Yet this is the closest we've come to major changes in Wheaton in a long time, ignoring the rather disappointing new strip malls being built by the unscrupulous developer Leonard Greenberg. 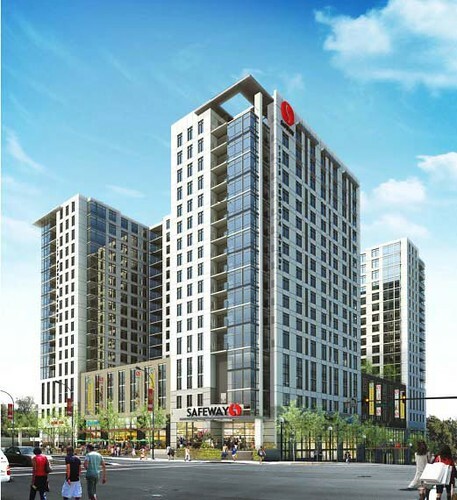 After all, an eighteen-story high rise (above) has already been approved on the site of the Safeway at Georgia and Reedie, something that would've been unthinkable five years ago. There's no better time to take up your signs and pitchforks and start clamoring for something more. Once again, that meeting is tonight at 7pm at the Crossway Community Center, 3015 Upton Drive in Kensington. B.F. Saul, WMATA and the county even have a nifty website with maps and more information. 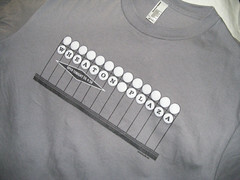 By the way: Are you the type that thinks eighteen stories is too much for downtown Wheaton? I thought about the same myself and, through the magic of Photoshop, decided to see what it would look like with just nine floors. Nope, definitely LOVE a 17-story building here. Should actually be 20 to max out the density on site. When your building literally borders a central business district Metro entrance just across the street, in this era you need to build this tall. Not only that, but it will give Wheaton a beautiful trophy building for the time being, located at the top of the two downtown Wheaton hills. And to think that all anyone needs to do to not have to increase density is to just use birth control responsibly and stop having too many kids. Incidentally, now that we're definitely past Peak Oil, people need to start figuring out how they're going to power all of that mass transit which is the ideological centerpiece of this sort of densification scheme. and as for the folks who say "but all around the world population is growing and so we must build now to prepare for them coming here", that's exactly the same thing as saying "all of our neighbors have cancer, so we should start smoking tobacco". Mass transit is for the most part not powered by oil. Most of it is powered by coal or nuclear power. That can continue on that path or it could be transitioned over to wind or other renewable sources of power. Buses, in the DC area, run on diesel or natural gas. We could run more on natural gas or begin to electrify our bus fleet. The metro is clearly run on electricity (mostly coal powered). With our without good family planning, density is always better. That's common sense from a resource-use perspective. Family planning is also important, but building up is greener than building out. Even if the world population didn't grow over today's population, we would still need increased density. Undense suburbs are using far too many resources for this world to sustain. "Even if the world population didn't grow over today's population, we would still need increased density. Undense suburbs are using far too many resources for this world to sustain." Well said Patrick. I never thought of it that way but that is so true that building up is better than building out. May be the new 18 story bldg. can feature a rooftop garden? There would be less ugly redundant 5-9 story condos if we would just build more REAL highrise buildings in the suburbs. Wheaton is incredibly dense and if any locale needs a highrise, it's Wheaton. Besides, there's simply no room in Wheaton to build a bunch of new real estate. So there's no choice but to build up if you want to create more density. I won't bother responding to the Malthusian arguments of Mr Hardman and disregard the larger question of whether this Safeway project is good for the planet. It is good for Wheaton. 17 stories may seem large when set among all the 50's era one-story buildings that currently surround it on 3 sides, but as other tall buildings are built it will seem less so. 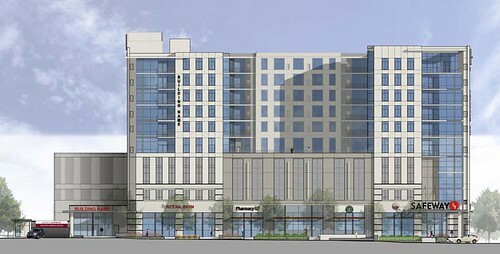 If you compare this rendering of the approved building to the one that was originally proposed I think it is a credit to the county that it was much improved by the process. Instead of one large mass it's been broken up into 3 connected towers. A huge improvement. The meeting last night was very well attended. Finally a Wheaton redevelopment meeting that wasn't just a utopian exercise. There is actual capital flowing into development projects. There are now developers interested in more than squatting on small parcels waiting for the grandkids to someday cash in. 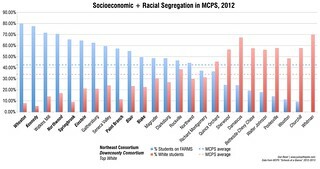 The county and WMATA seem to be going about this the right way. Wheaton has the opportunity to be a dense, small downtown that grows more organically than SS or Rockville. Let the replacement of the strip malls commence! So. they build more apartments, to increase the density. Now, will they widen Georgia Avenue, University Blvd. Conneticut Ave, Viers mill road-- I doubt it. Do people really think these new apartment dwellers will all use public transportation? Where will these new people park their cars? How much more air pollution will they add? If we build less, less will come- and there will be less density. Georgia Avenue southbound is a parking lot every morning. It is a parking lot northbound in the afternoon. If there is an accident- well Lord help the commuter. I couldn't make it to the meeting, but am glad to see the discussion here. I'd like to see more reason to spend money and time in downtown Wheaton, and fewer empty storefronts. When I think of supporting local businesses, I think of pollo, but there's only so many times I can get takeout chicken for the family. Looking for something to do in Wheaton besides takeout chicken and find yourself with sea chantys running around your head? How about Sea Chanty nights at the Royal Mile, the first Tuesday of every month. It's a blast! retgrok: "Do people really think these new apartment dwellers will all use public transportation?" I recently bought a place really close to the metro in DTSS. Why? Because I wanted to be by the metro. I either walk or take public transportation everywhere. People wouldn't move right by the Wheaton metro if they were going to drive everywhere. You can get a much cheaper place to live if you're willing to be a sucker and live far from a metro. But this new development is aimed at people who want to use the metro and public transportation. If anything, I'm sure this project will provide for too much parking and car infrastructure. DTSS has far too much car infrastructure for the demand and parking in the US is always offered at below market rates (often even for free). But there is no such thing as free parking. Do you or any of the other Urban Densifiers realize that at the core of all of your arguments is, well, the concept of "core"? Generally speaking, we are a post-industrial nation and as such we can and should be a distributed nation. Look at it this way: it's just fine for me to live in the the far-flung suburbs if I can work there (home office and telecommute) and can walk to shopping and the library and the hospital is just up the road. The only time I'm "consuming excess resources" is if I take a job downtown. In that case I'm adding to traffic and the waste of gasoline expended idling in a traffic jam. You know, if there were more places in Wheaton for people to work -- there are plenty now but most don't pay at professional scale -- then the whole issue of non-bus mass transit fades to near insignificance. If there were more jobs in Olney for the people who can afford to live there, it would be that much less traffic on Georgia Avenue. Yet zoning doesn't allow this. So is the culprit here that the high-pay jobs are downtown but acceptable housing (for the high-pay folks) is available only at the outskirts? Clearly you and a lot of other Urban Densificationists feel that it's far more important to move the housing closer to the employment core, than to promote the employment cores moving towards the residential zones. Densification near the core certainly does make sense but I think that it's only one prong of a more complex set of solutions. But as someone else here remarked, let's not make this all about saving the planet, let's make this all about saving Wheaton. If we can kill two birds with one stone, so to speak, let's do that. Just keep in mind that it's not the Holy Grail. Also keep in mind that limiting population growth, globally, is a very good idea. Note please that the UN has just declared that the planet is on the edge of a "dangerous" food crisis. Um was someone just deprecating poor Reverend Malthus? I LOVE how this rendering shows NO ONE in the shade as if 17+ stories won't block the sun from at least one side. Evidence: Rt 410 - between NOAA and Blair East -- a cold canyon of darknees most hours of the day.